Another champion from Western Australia, Peter Robert Bosustow spent only three seasons at Carlton from 1981 to 1983 - but his impact during his all too brief career blazed his name into the history of the Navy Blues. The son of Bob Bosustow, who had played 20 games for Carlton in seasons 1955-56, “Buzz” Bosustow was a brilliant, mercurial match-winner – a freakish high mark, a magical ball-handler, and a deadly sharpshooter at goal. Although prone to inconsistency, he was an outstanding big match performer whose cat-like reflexes and uncanny anticipation thrilled friend and foe alike. During his 65 games in Carlton’s guernsey number 4, Bosustow kicked 146 goals at an average of better than two per game, and suffered defeat only 15 times. He was instrumental in Carlton’s glorious 1981 and '82 Premiership double, and led the Blues' goal-kicking in 1981 with 59 goals. Few players in the history of VFL/AFL football have had a more spectacular debut year than “The Buzz,” who also won Mark of the Year, Goal of the Year as well as a Premiership medal in his first season in Victoria. Earlier, Bosustow had played throughout his junior football career with the Victoria Park Raiders, before following in his father’s footsteps and joining the Perth Demons in 1975. It was a very fortuitous time for the 17 year-old, because the Demons were on the verge of a golden era. Bosustow took a year or so to establish himself under legendary coach Ken Armstrong, and was a reserve in the club’s 1977 WAFL Grand Final victory over East Fremantle. But the following year, he kicked seven of Perth’s 12 goals when the Demons lost the Grand Final to East Perth by two points, and in the opinion of more than one good judge, was desperately unlucky not to be awarded the Simpson Medal as best on ground. By 1980, “Buzza” was one of the stars of the WAFL. Already a Premiership player, a two-time leading goal-kicker for the Demons, and a WA state representative on four occasions, he was pursued hard by a number of VFL clubs, although the Blues had the inside running for his signature because of his father’s previous affiliation. After flying both Bob and Peter to their round 9, 1980 Sunday game against Essendon in Sydney, the Blues gained their prized signature at last, under the Father-Son rule then in place. “I was that excited that I was going to wear the Navy Blue jumper,” Bosustow said later. “It wasn’t a fluke that I chose Carlton. I had two players that I really wanted to play football with – one was Wayne Johnston, and the other was Mark Maclure”. Throughout the next two seasons in particular, this trio was to form one of the greatest half-forward lines in Carlton’s history. Almost from the moment he arrived at Princes Park, Bosustow gate-crashed a Carlton squad that just two years previously had won the VFL flag, then blown the opportunity to make it two in a row in 1980. Under a new coach in David Parkin the club was hell-bent on redemption, and had assembled a team list as classy as any other in the club’s history. Parkin's coaching style demanded discipline in all aspects of the game, but he quickly recognised that in “The Buzz” he had a rare talent – a player who flourished without restraint, who relished a personal challenge, and was capable of wresting the initiative from any rival with just a quarter or two of football magic. Under Parkin, Bosustow’s impact on his new team and the competition was dramatic, and immediate. In only his second game - during the second quarter of Carlton's Round 2, 1981 match against Hawthorn at Princes Park, the Blues were kicking to the scoreboard end when “Buzz” marked out on the wing, chip-passed to Wayne Johnston and sprinted hard to create the loose man. His opponent – Hawthorn hard man Robert Dipierdomenico - ran to block him, but Bosustow dipped his shoulder and crashed through the beefy Hawk right in front of the old press box. A resounding crack was heard (to the roar of an adoring throng) and “Dipper's” season was prematurely ended by a broken sternum. Seven weeks later, shortly after he was famously described as a “good, ordinary player” by the legendary Jack Dyer, Bosustow soared for some spectacular marks and kicked eight goals to spearhead the Blues to a 99-point demolition of South Melbourne at Princes Park. By August, Carlton were on top of the ladder and about to celebrate Bruce Doull’s 250th game for the club, when Geelong arrived at Princes Park for the match of the day. However, the abiding memory thereafter for the huge crowd on that afternoon was Bosustow's breathtaking Mark of the Year in the forward pocket at the Heatley Stand end. Launching himself into the stratosphere above Geelong ruckman John Mossop (and another noted aerialist in Carlton's David McKay) “Buzz” took an absolute screamer on his chest. It took him an eternity to line up for the easy goal that followed, such was the excitement among the crowd. That September, the same two sides met again in the second Semi Final at Waverley Park, and the Bosustow Show produced more excitement when he smothered the ball off the boot of Cat Ian Nankervis, and snapped a brilliant angled goal over his shoulder in a solo effort later judged Goal of the Year. Completing a fairytale first season, Carlton went on to steamroll Collingwood in the last quarter of the 1981 Grand Final, allowing “Buzz” to finish the year as a Premiership player, Carlton’s leading goal-kicker, and a bona fide star of the VFL. Bosustow began 1982 in similar fashion, booting six goals against Hawthorn in round 4, and another half-dozen against the Sydney Swans in a record-breaking win by 102 points at Princes Park in round 9. Carlton finished the home and away season third on the ladder behind Richmond and Hawthorn, before clawing their way through to another Grand Final against the Tigers. Having played one less final and having comfortably defeated the Blues in the second Semi Final, Richmond started the decider as warm favourites, but Carlton dug deeper when it counted most and emerged victorious by 18 points in front of 107,000 at the MCG. Two flags in two years was a dream come true for Bosustow, whose tally of 47 goals for the season was only beaten by another West Australian, Ross Ditchburn, who booted 61 majors to top the Blues’ list. Injury delayed the start of Bosustow’s 1983 season until round 3, but his 13 big marks and six goals in a 10-point win over Collingwood was worth the wait, and prompted David Parkin to remark, “In the end, he was the difference between the two sides. He can really play footy when he makes up his mind that he wants to.” Another haul of six majors against Geelong in round 6 added some momentum to the Blues, but a spate of late-season injuries and a couple of incidents during the round 21 match against North Melbourne at Princes Park in late August ultimately derailed Carlton’s title defence. During a torrid first quarter, “Buzz” was reported for striking North Melbourne opponents in two separate incidents, and subsequently rubbed out for four weeks. This meant that he could only play again that year if Carlton made the Grand Final – which they were not able to do. In what turned out to be a prophetic statement, a clearly upset Bosustow stated after his tribunal appearance; “I am absolutely shattered. When the sentence was delivered, I thought my career in Melbourne was all over.” Unfortunately for Bosustow and Carlton’s many thousands of disappointed supporters, it was. In 1984, “Buzza” returned to WA and the Perth football Club, as his father had been diagnosed with leukemia and he had just opened a series of sporting stores in Perth. Bosustow would once again the Demon’s top goal-kicker, and represented his home state in matches against Victoria and South Australia. He was almost about to be cleared back to Carlton but Perth and Carlton couldn't agree upon the clearance fee and it fell through and he stayed the season with Perth FC. It was rumoured that Perth wanted $25,000 but Carlton would only agree upon $20,000, Bosustow would lament later on that only if he knew the sticking point was $5,000 he would have paid the difference himself to facilitate the clearance. The frustration felt by Buzz not being able to head back to his beloved Blues resulted in him putting his fist through a plate glass shower door that resulted him missing the remainder of the 1984 season. The lure of VFL football remained strong however, and at the end of the 1985 season he arrived back at Princes Park for another crack at the big time and was preparing for the 1986 pre-season training program. He had almost completed pre-season training when he trod on a sprinkler head, and damaged an ankle so badly that he wasn't able to run again until late in the year. By then his time had passed, and another future champion in 'Sticks' Kernahan had claimed the No. 4 guernsey. 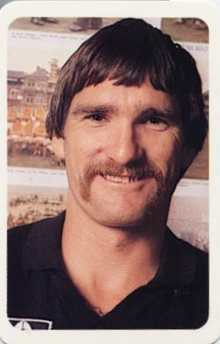 As well as his exploits at Carlton, Bosustow played 141 senior games for Perth from 1975 to 1980, 1984 to 1985, and 1987. In all, he kicked 357 goals and was the Demons’ leading goal-kicker three times, with a season's high of 75 in 1980. He represented Western Australia eight times, booting 17 goals, and was named on the half-forward flank in Perth’s Team of the Century (1899 – 1999). Peter Bosustow's uncle Tom Allison and cousin Brett Allison both played senior football with Nth Melbourne, Brett also played a season with the Sydney Swans. During an interview some years afterward, Bosustow revealed that he had had a strong premonition that he would take his Mark of the Year in that match against Geelong, and beforehand, had promised Mark Maclure a ride in his new car. While playing at Carlton, Bosustow boarded with the club’s doorman, roustabout and legendary character Leo Brooks, who was the grandfather of infamous underworld identities Mark and Jason Moran. Among of a number of other country and interstate recruits looked after by the Brooks family at their home in Drummond St., Carlton was future club captain (and AFL Commission President) Mike Fitzpatrick. Bosustow played eight inter-state matches for WA, the first in 1978, and the last ten seasons later, when WA suffered a shock loss to NSW during the 1988 AFL Bicentenary Carnival in Adelaide. NSW, coached by Tom Hafey and captained by Terry Daniher, knocked over their more fancied rivals by two points. Besides Bosustow, four other players in that WA team; Richard Dennis, Earl Spalding, John Worsfold and Dean Laidley, would later join Carlton as either players or coaches. Peter’s son, Brent Bosustow, played 15 games for South Fremantle in the WAFL between 2003 and 2006, and one game for Swan Districts in 2007. He was named the South Fremantle Colts’ Best and Fairest player in their 2003 Premiership season, but turned down a position on Carlton's Rookie list to pursue a career in business. In 2014, amid celebrations of Carlton's 150th year of competition, the club produced a list of the Blues' 150 greatest players. A furore erupted when Peter Bosustow was left out - because his career did not fulfil the criteria of 50 games played over five seasons. It had taken him only three seasons to reach 65 games. Contributors to this page: Bombasheldon , Jarusa , PatsFitztrick , molsey , WillowBlue , pblue , p(12)terg , dgreen2 , keogh , true_blue24 , BlueWorld and admin . Page last modified on Tuesday 15 of January, 2019 22:15:54 AEDT by Bombasheldon. 1987 2nd Semi - Kernahan takes a crucial mark in the last quarter.